Pictorial maps are often some of the most artistic, combining illustrations of a theme to create a dramatic, attractive poster. They are commonly used to build a picture of a phenomena that perhaps draws people in who have some vested interest in the content…sport being a favourite theme for such maps because of the passion and association people bring to the map. 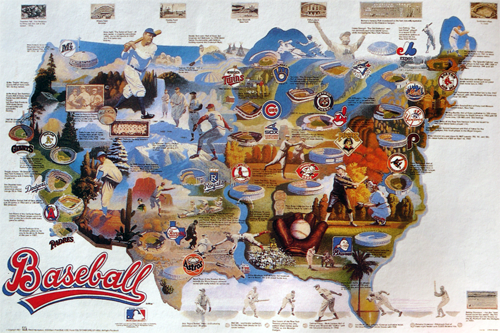 Here are two examples of maps by World Impressions that showcase the very best of the collage approach that incorporates key imagery from all teams. the first illustrates baseball and the second, American Football. The illustrations vary considerably from paintings of the natural landscape to key historic sportsmen to stadiums and team logos. 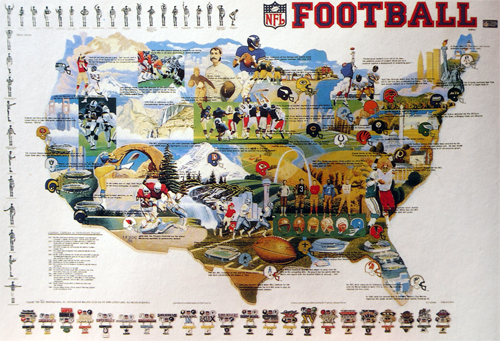 The lack of uniformity creates interest and the poster allows a viewer of the map to immediately identify their own team as well as their opponents across a map that gives them an equal visual treatment. Textual components are minimal but the borders are well framed using allied imagery. Here we have a map that is designed simply to stimulate our passion for the sport and the teams we support. It shows where the teams are based but the spatial component is secondary to the emotional response the map is intended to invoke. Done well, as these two maps are, pictorial maps can be attractive as pieces of art. They often adorn our walls and act as a reminder of our team and their place. There’s something uniquely compelling about the shapes that maps make. The outlines of countries, in particular, are one-off. They are instantly recognisable and allow artists and illustrators, as well as cartographers, a rich seam to exploit. There’s arguably no better way of representing something than combining a theme with a map shape. Take this fantastic example from Sports Illustrated in 1990. 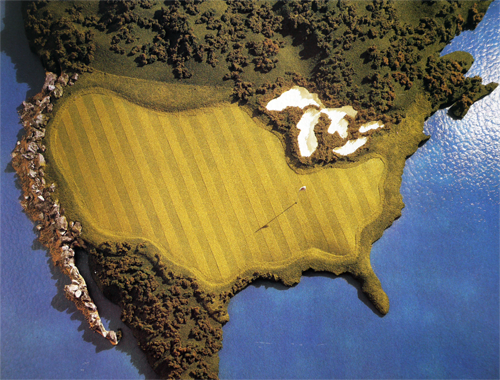 The illustration is a wonderful use of the shape of the United States used as a golf green. The surrounding water hazards are depicted in a rich blue, the greens are lush and the ‘rough’ in Canada and Mexico frames the green perfectly. Even the Great Lakes are turned into a series of bunkers. The illustration was commissioned to accompany an article about the massive growth in interest in golf at the time. The use of the map emphasises the point, making us see the spread of golf as nationwide. Whether the intent was to provide a strong message or not, the illustration shows us the extent to which map shapes can be used artistically.